With the latest round of UN climate change negotiations mere weeks away in Paris, there is increasing interest in figuring out what countries’ post-2020 climate action plans—known as Intended Nationally Determined Contributions or INDCs— will do to address climate change. It is important to look inside those plans to understand how they will make the shift to a low-carbon future. In a new publication, Assessing the Post-2020 Clean Energy Landscape, WRI found that 80 percent of the INDCs submitted by October 26, 2015, contain plans to increase clean energy supply (through renewables, or a combination of renewables and nuclear). 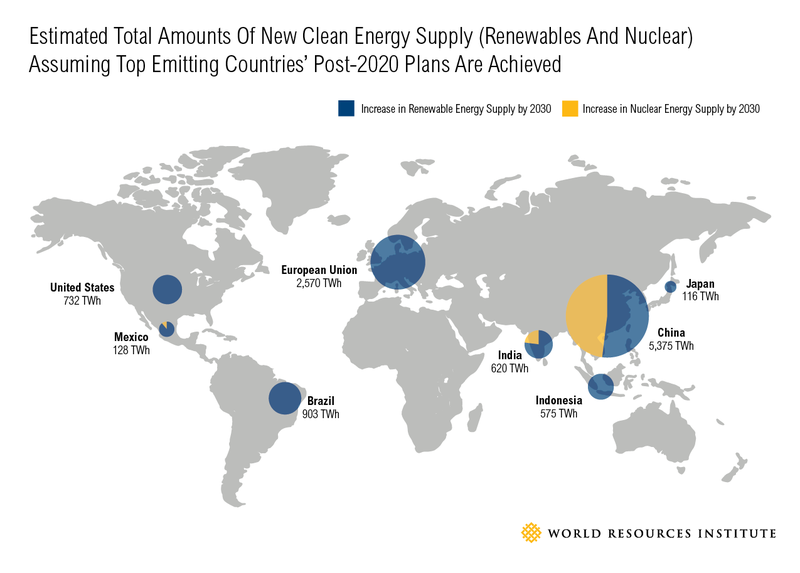 And if some of the biggest greenhouse gas (GHG) emitters -- China, the United States, the European Union, India, Indonesia, Brazil, Japan and Mexico -- achieve their post-2020 plans, total clean energy supply may increase by roughly 11,000 terawatt hours (TWh) by 2030. That’s enough clean energy to meet all of India’s current energy demand. The plans of the same eight top GHG emitters also suggest that their collective supply of renewable energy alone could jump by 8,300 TWh by 2030, nearly double 2012 levels for this group. These renewable energy levels are 18 percent higher than this study’s baseline growth rates. So far, 128 INDCs have been submitted, representing 155 countries and roughly 87 percent of global GHG emissions. More than 100 INDCs include plans to scale up clean energy supply between 2020 and 2030. These plans are included because countries are looking for ways to limit GHG emissions while sustaining economic growth, boosting energy security and providing energy access to the billions of people who lack it now. Clean energy responds to all of those interests. Among the 80 percent of the INDCs submitted that contain language suggesting an increase in levels of clean energy supply, plans are generally framed in the context of planned actions (for instance, renewable energy policies and feed-in tariffs) or desired outcomes (such as increasing the share of clean energy).These plans have been made across the board, from major developed and emerging economies, to small islands states and least developed countries. For the world’s top emitters, the transition to clean energy will be a crucial part of the solution to achieve deep reductions in emissions to tackle climate change. Transforming the global energy mix as a whole is dependent upon how much clean energy each of these large economies can generate. Several of the top emitters—China, India, Indonesia, Brazil, and Japan—included clean energy goals as part of their INDCs while the EU and Mexico have already codified their goals through legislation and the United States has made a high-level statement declaring its goal. If all these post-2020 plans are achieved, total renewable energy supply for the top eight emitters could nearly double by 2030. 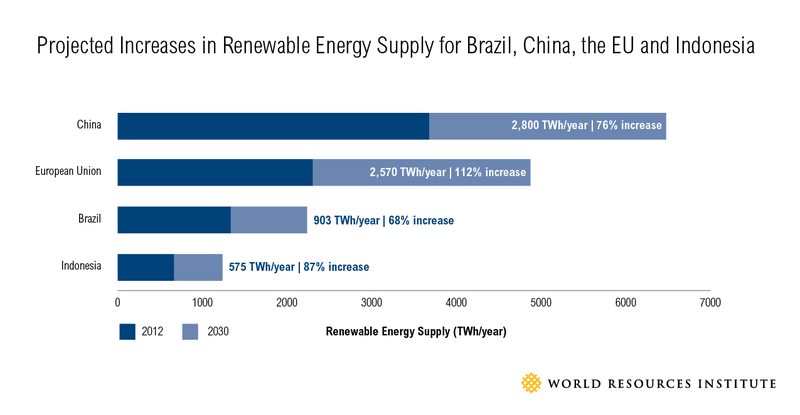 These estimates also exceed this study’s baseline projections of renewables growth by around 2,600 TWh, or 18 percent, demonstrating how ambitious the plans are. The graphics below show the increase in renewable energy supply suggested by these plans, according to plan type (renewable energy supply or renewable electricity generation). 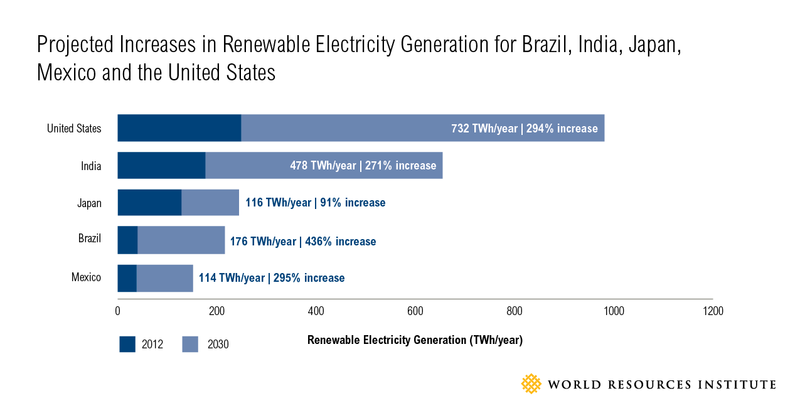 Additional estimates of installed renewable electrical capacity – the maximum amount of electricity a given generator can produce -- show that Brazil, India, Japan, Mexico and the United States are set to increase renewable capacity by a total of 562 gigawatts (GW) by 2030, which is 142 GW more than current projections. To put that in perspective, 142 GW is more than the current renewable electrical capacity of Germany and Italy combined. Post-2020 plans of China, India and Mexico also state their intentions of increasing nuclear capacity. If their indicative targets are achieved, we could see a tenfold increase in nuclear energy supply between 2012 and 2030. While we wait for the landmark conclusion in Paris, it’s clear the UN process has already played a catalytic and transformative role. The vision for the future global energy mix, as suggested by countries’ post-2020 plans, should galvanize further action and drive investment in clean energy technologies.